Direct current machines are energy transfer devices. These machines can function as either a motor or a generator. DC motors and generators have the same basic construction, differing primarily in the energy conversion. To better understand the operation and construction of DC machines, a few basic terms must be understood. The purpose of the armature is to provide the energy conversion in a DC machine (refer to Figure 2). 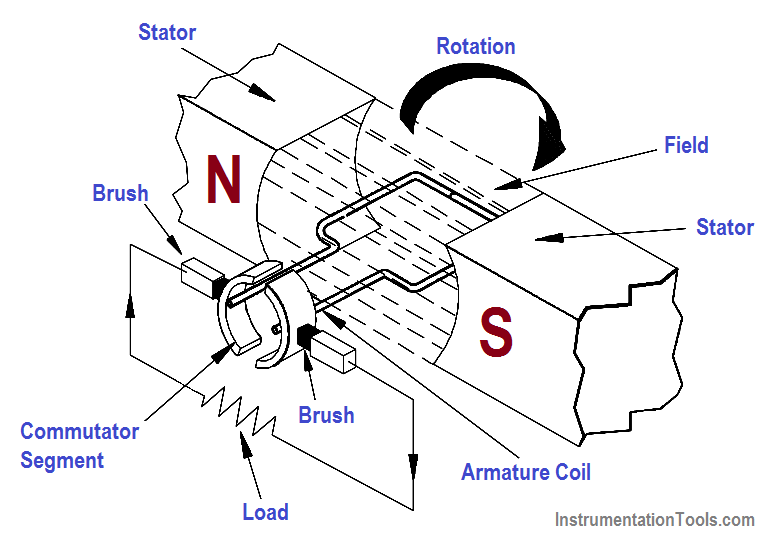 In a DC generator, the armature is rotated by an external mechanical force, such as a steam turbine. This rotation induces a voltage and current flow in the armature. Thus, the armature converts mechanical energy to electrical energy. In a DC motor, the armature receives voltage from an outside electrical source and converts electrical energy into mechanical energy in the form of torque. The purpose of the rotor is to provide the rotating element in a DC machine (refer to Figure 2). In a DC generator, the rotor is the component that is rotated by an external force. In a DC motor, the rotor is the component that turns a piece of equipment. In both types of DC machines, the rotor is the armature. The stator is the part of a motor or generator that is stationary (refer to Figure 2). In DC machines, the purpose of the stator is to provide the magnetic field. The stator in Figure 2 is provided by a permanent magnet. The purpose of the field in a DC machine is to provide a magnetic field for producing either a voltage (generator) or a torque (motor) (refer to Figure 2). The field in a DC machine is produced by either a permanent magnet or an electromagnet. Normally, electromagnets are used because they have an increased magnetic strength, and the magnetic strength is more easily varied using external devices. In Figure 2, the field is provided by the stator.